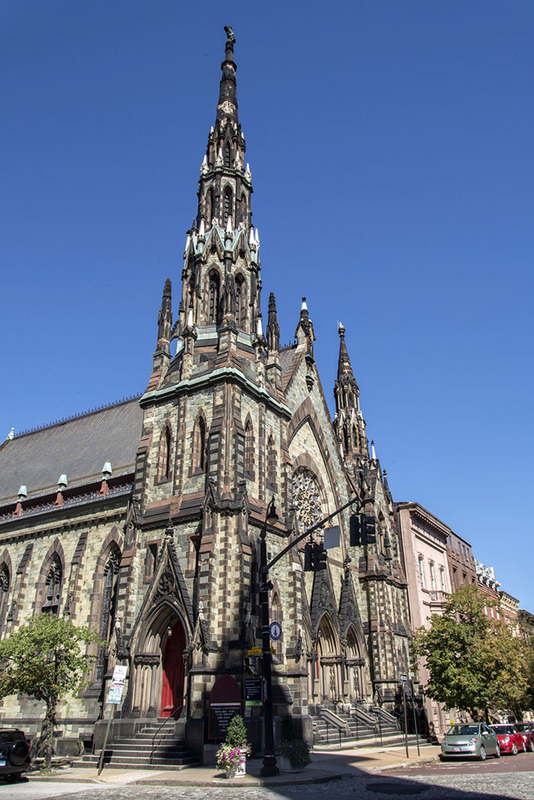 Completed in 1872 as a “Cathedral of Methodism,” the Norman-Gothic Mount Vernon Place United Methodist Church was a signature achievement for the noted Baltimore architects Thomas Dixon and Charles L. Carson. It was also at first an immense source of aggravation to its neighbors. 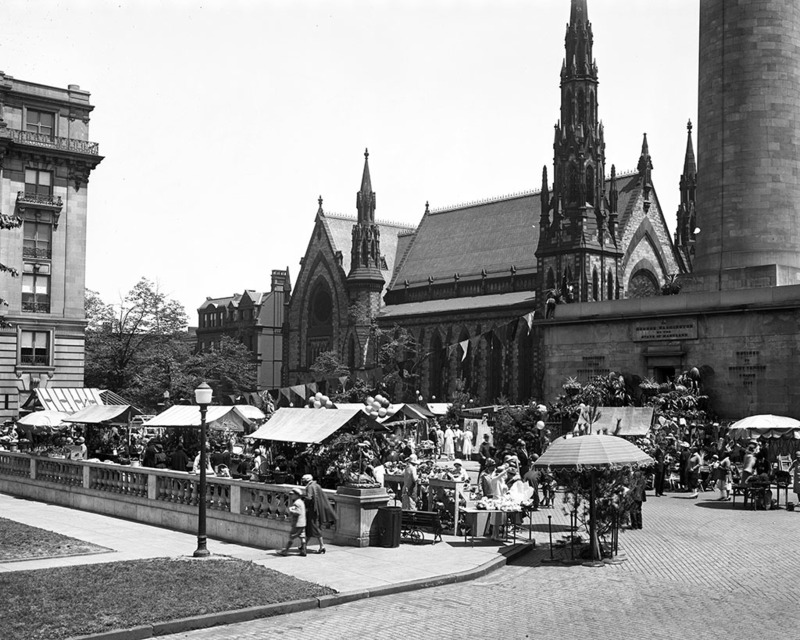 By the 1870s, Mount Vernon had become the place to live for Baltimore’s elite, and Mount Vernon Place with the Washington Monument was the central jewel of the community. The church’s heavy presence off the north park, green serpentine stone amidst the Baltimore brick and more subdued color palate, and steeple that reached nearly to the top of President Washington’s head sparked a great deal of angst. The fact that the church replaced the house where Francis Scott Key passed away did not help sooth the neighbors. The house was the home of Key’s daughter and her husband, Elizabeth Phoebe Key and Charles Howard. After its early days, however, the church has become a central and admired part of Mount Vernon Place. Architecturally, it was built of striking green serpentine stone, as well as buff, olive and red sandstone. Architects Dixon and Carson embellished it with polished granite columns and carved designs taken from nature. Its many gothic details of flying buttresses, a tower, and arches are purely esthetic in function, as the building is constructed over an iron framework. There are even grotesque stone faces above the windows on the west front (three full cut, two in profile) said to be likenesses of prominent persons living at the time the church was built. On the inside, the church is notable for its iron supporting columns, carved wooden beams, and stained glass cross window over the pulpit. 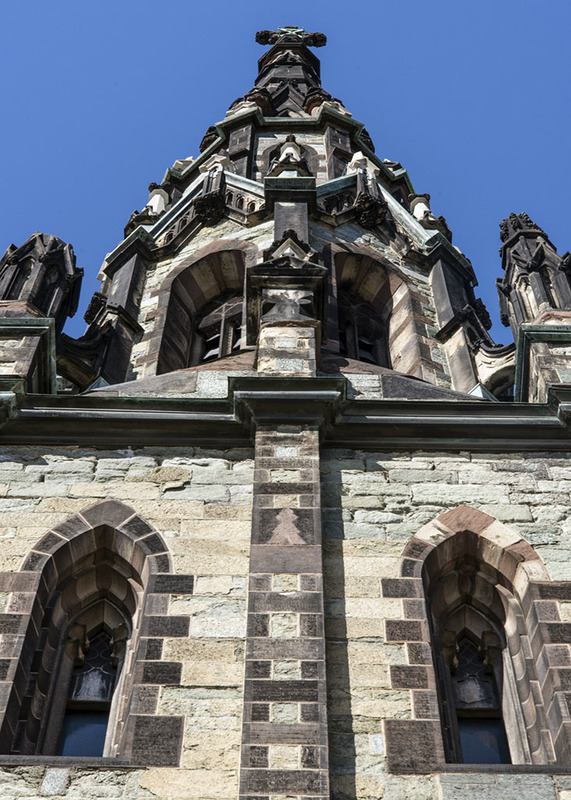 In addition to its architecture, the church’s congregation has made its mark on Baltimore as well. The group began in a building on Lovely Lane (intersecting today’s Redwood Street downtown) and is credited with launching the Methodist Episcopal Church in the United States in 1784. The current church on Mount Vernon Place is the congregation’s fourth home. 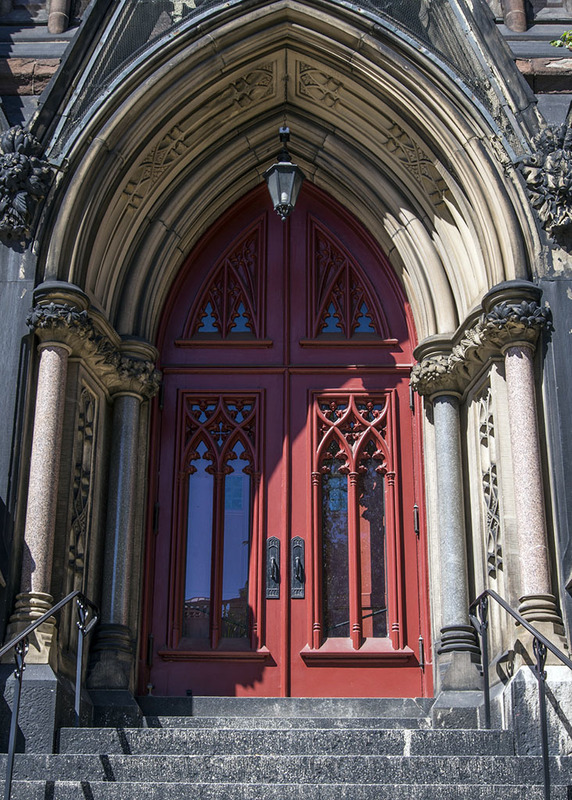 In addition to its spiritual work, the congregation has provided innumerable secular services to Baltimore. In World War II, the church provided beds, food and entertainment to servicemen returning from the front. 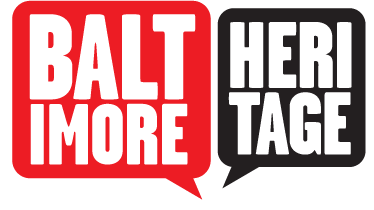 Beginning in the 1970s, they led efforts to help runaway teenagers and victims of drug abuse, and began a service organization to engage young Baltimoreans in helping their city. The congregation today continues its service to Baltimore in many ways, including opening to tours and the curious public. 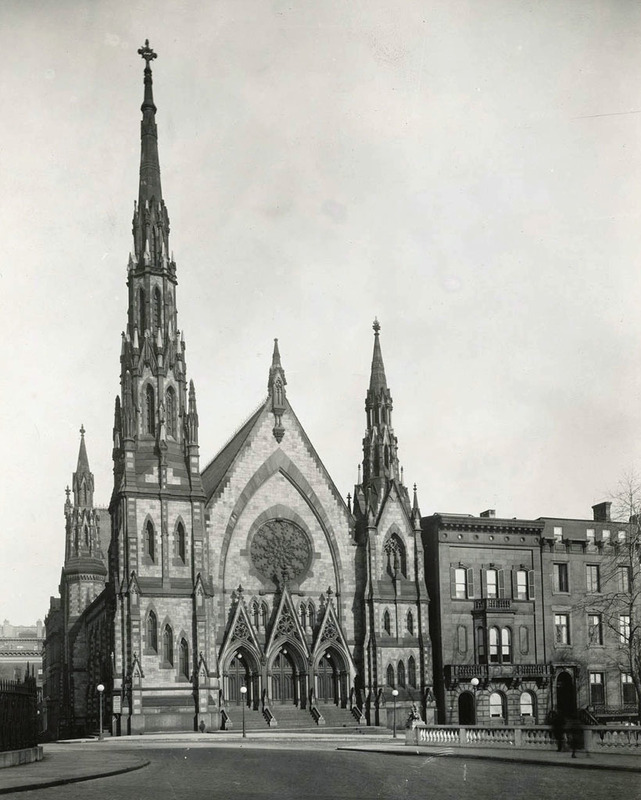 “Mount Vernon Place United Methodist Church,” Explore Baltimore Heritage, accessed April 19, 2019, https://explore.baltimoreheritage.org/items/show/562.